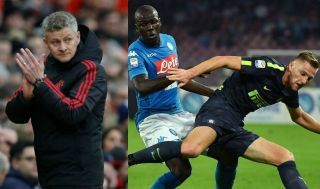 Man Utd have suffered a setback as reported transfer target and Inter defender Milan Skriniar has revealed he’s close to signing a contract renewal with the Italian giants. As noted by the Independent last week, the 24-year-old was said to have emerged as United’s top target to bolster their defence this summer. It comes as he continues to impress for the Nerazzurri, establishing himself as a fundamental figure in their backline since arriving from Sampdoria in 2017. He’s gone on to make 61 appearances since, helping the Italian giants return to the Champions League while they also continue to battle for a top-four finish in Serie A again this season. With that in mind, it would come as no surprise if Inter had no intention of letting him leave, and they’ve been handed a major boost as Skriniar himself has now revealed that he’s close to penning a new contract. “I have a great relationship with the club, we are close to the renewal,” he said, as noted by Calciomercato. With that in mind, it’s a big blow for Man Utd, as they will now surely have to focus their attention elsewhere in their bid to finally bring in a defender. Although things have improved under interim boss Ole Gunnar Solskjaer, United have conceded 35 goals in 26 Premier League games so far this season, giving them the second worst defensive record of the top eight teams. To put that into greater context, leaders Man City have conceded 20 goals, while Liverpool have let in just 15 as the pair battle for the title. In turn, it’s an area in which the Red Devils could still improve, with Victor Lindelof arguably looking for a defensive partner having established himself as an ever-present since Solskjaer took charge.